St Marie φ Walker, the artist duo comprised of Denise St. Marie and Timothy Walker are guiding a community driven art project for the Midtown KW neighbourhood. They have produced custom signs that are temporarily installed in various parts of the Midtown community. St Marie φ Walker hosted a series of meetings, casual conversations and dinners to elicit thoughtful statements from community members about their neighbourhood. They decided on the most poignant and whimsical quotes to be placed on the sign works. 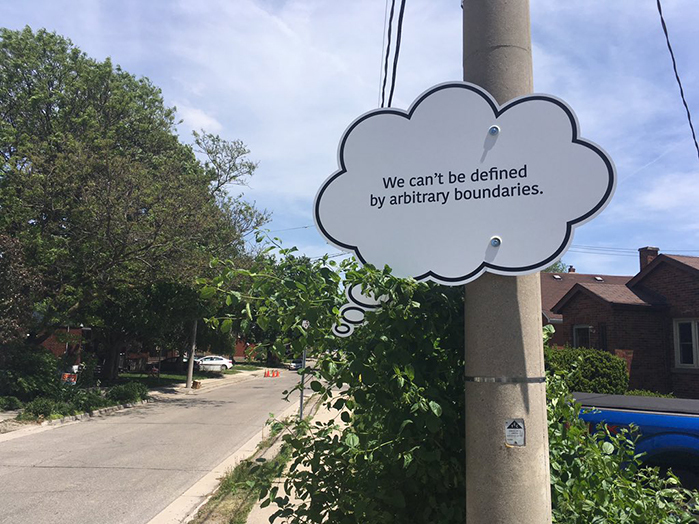 The signs are shaped like thought bubbles, containing these reflective statements about the community — created by the community. St Marie φ Walker is the working name of the collaborative artists Denise St. Marie and Timothy Walker. The art they create is at once conceptual and interactively social. Their work has been installed nationally and internationally under their former collective name of Timeanddesire. Currently their work A(d)version is installed as part of Lèche Vitrine: Open Sesame Project Window at Open Sesame in Kitchener. Their project Community Thoughts began with a series of meetings, casual conversations and dinners to collect thoughtful statements from community members about their neighbourhood. They then decided on the most poignant and whimsical quotes to be placed on the sign works. The signs are shaped like thought bubbles, containing reflective statements about the community— created by the community. Harking back to the "place your face in photo stand-ins," this project will act as an amusing photographic opportunity, animating and marking a moment in time. Community members can stand below the thought bubble of their choice and photograph or instagram themselves with friends and family. For the community these works may create experiences of discovery, conversation starters and a novel expression of people’s internal sense of belonging. Additionally, community members can use the signs as a site of engagement. St Marie φ Walker live and work in Kitchener. Denise St. Marie completed her Bachelor of Fine Arts at the University of Victoria in BC, focusing on printmaking, multiples, and site-specific sculpture. Influenced by her previous 2 years of studies in Psychology, she used a multidisciplinary approach to her art by adding interventions to the streets of Victoria from 2000-03. As her practice grew she began collaborating with Timothy Walker in 2010, both nationally and internationally. Currently her work investigates social structures, levels of communication, contextual use of messaging, notions of micro/macro and recursive absurdity. In 2016 she was awarded a Social Sciences and Humanities Research Council (SSHRC) grant in conjunction with her MFA thesis research. Timothy Walker is a collaborative artist who works closely with fellow artist and graduate student Denise St Marie. Together their practice consists largely of text-based work focused on the human condition. They often explore themes relating to perception, value and social relations, and how these can become shaped/formed by various belief structures. Walker graduated in 2012 with a BA specializing in Philosophy from the University of Toronto. He has recently exhibited work at the Art Gallery of Windsor, the Art Gallery of Mississauga and Nuit Blanche Toronto. Community Thoughts has been made possible in part with the support of City of Kitchener, Neighbourhood Placemaking Challenge, Kitchener Waterloo Community Foundation and Your Neighbourhood Credit Union. Image top: Dan Lauckner; Image Below courtesy of St Marie φ Walker.